In this workshop/series, we will explore bhakti yoga, mantra and authentically coming together as women in a sacred and empowered way. We will study and delve in to the essence of Durga, Saraswati, Lakshmi and other female archetypes whom are fundamental to yoga, in order to deepen our own practice and understanding of ourselves as women. Through meditaion, sound, story, self-inquiry, and song, we will begin to experience how yoga practices relating to the feminine can unlock our own powerful wisdom within. Luna has reached a fresh and authentic level of perfection and beauty with her music. This was the best concert I have ever had at my studio! Luna's music simply put, is magical and luminous. Luna has a unique quality in her voice that transmits something special, a kind of nectar that permeates all. There are many Chant CDs now for the Yoga market (and I work on quite a few of them) but this one stands out and deserves to be included. There is an honesty in the performance, a creativity in the musical ideas, and a surprising variety or arrangements that is refreshing for this genre of music. Kristin has a great voice and charms us on all levels. 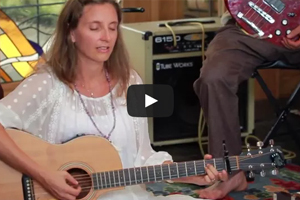 The sound and feeling of the music of Kristin Luna Ray is reminiscent of early Krishna Das and Wah! Luna's music is awesome. Her voice is pleasant and smooth and gives me chills. And best of all, she picked me up and took me into this peaceful and joyful world within me. Luna's voice is inspired and uplifting - her music weaves a beautifully moving and gracious atmosphere throughout. It's definitely worth experiencing. Luna came to our small community and transformed our yoga studio into a sacred dwelling. There is a deep and sincere honesty that is reflected in her music and her presence that brings together people in an extraordinary way.